Chicken has an important role on the Mediterranean table, it was a more accessible meat and traditionally consumed once a week. And while some people consider chicken a bit boring, in the Greek kitchen it is transformed. 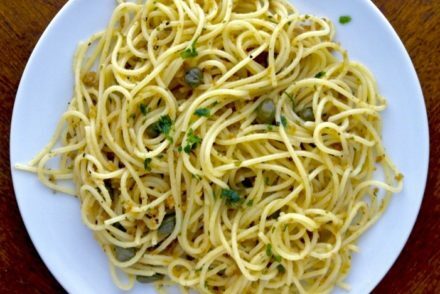 Cooked with herbs or in sauces it is a family favorite. 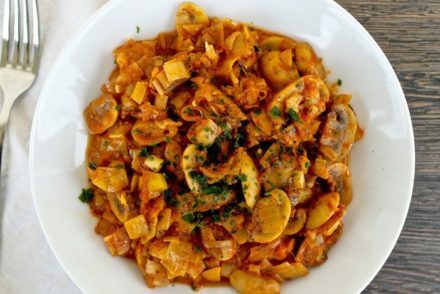 Usually we will make it the classic way: roasted with lemon and oregano with potatoes or my favorite: kotopoulo kokkinisto, which is chicken stewed in a pot with tomato and herbs and served with pasta or rice. But some days, especially weekdays, time is limited and I need to make something that takes little time to prepare and easy to take with you for lunch the next day and this recipe is perfect for that. 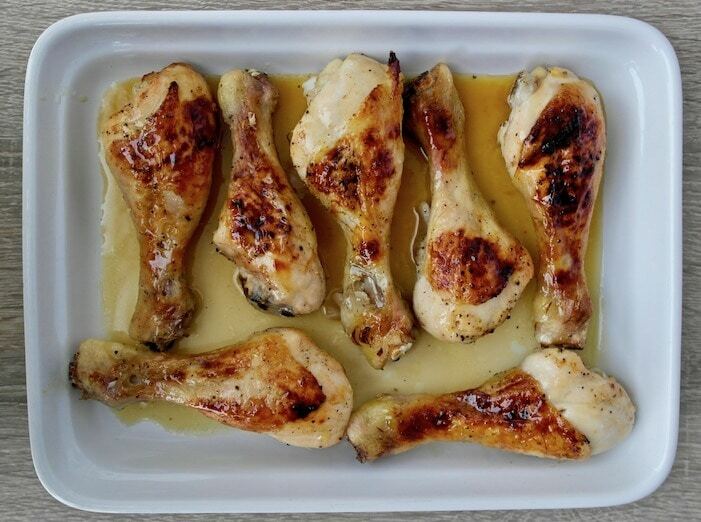 These baked honey lemon chicken legs only takes a few minutes to prepare and then they go straight to the oven. I generally prefer chicken legs because they are easier to handle, kids love them and they combine both white and brown meat, plus they are cheaper than the popular skinless boneless chicken breasts. However, I have also made this recipe using the breasts and it results in a moist, flavorful meal as well. 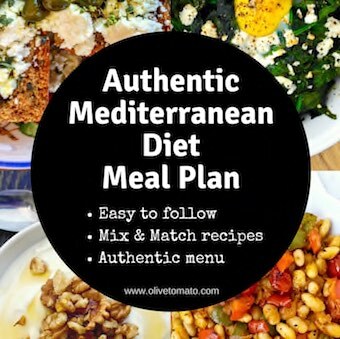 The ingredients are simple, found in any Mediterranean kitchen, or really any kitchen. The result is juicy meat with a crispy skin. You can combine this with a salad or any vegetable you have on hand. I add a bit of garlic, by tucking a small piece under each leg. You can remove the skin if you want to save some calories and fat. Wash the chicken and dry with paper towels. In a small pan heat the lemon, the olive oil and the honey with some pepper for a few minutes. 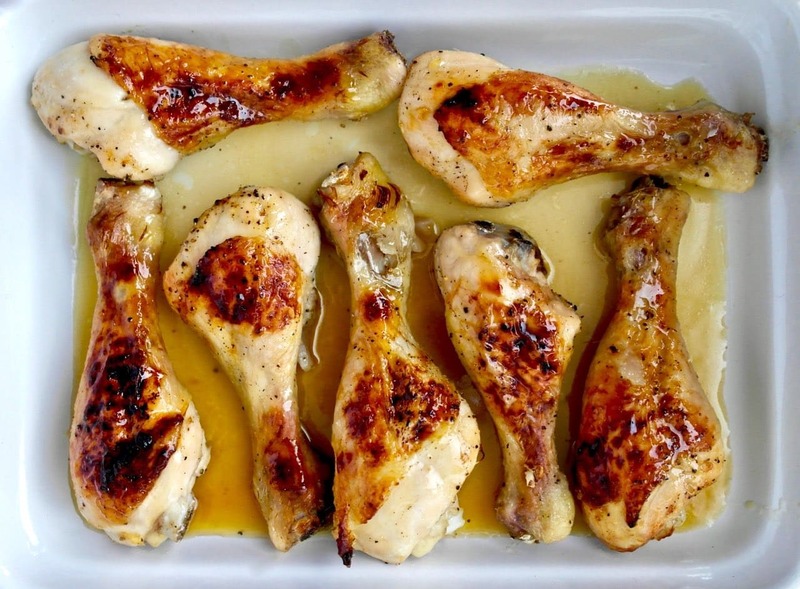 Place the chicken legs in a pan so that all chicken is close together in one layer, drizzle with the honey-lemon mixture. Mix so that the mixture has covered all the chicken pieces. Place a small garlic piece under each chicken leg. Put in oven. Bake for about 25-30 minutes, until temperature of chicken reaches 165 degrees. Remove chicken from pan and set aside. You may pass it under the broiler for 1-2 minutes to get it crispy. Pour leftover honey mixture from the pan, in a small sauce pan and simmer (low heat) while stirring for about 5 minutes, until mixture reduces to about half (it will be thick). *Place the chicken in a pan that fits the chicken snuggly so that the sauce raises high around the chicken rather than spread out. *Make sure you check the chicken while it is baking and brush the surface a couple of times so the chicken does not dry out, and do not over bake, otherwise you will have dry, tough chicken. So start taking the temperature of the meat with a thermometer at around 20 minutes and remove from the oven when the temperature reaches 165 degrees Fahrenheit (74 Celsius). *If they have not browned on top, you can pass them under the broiler to get the crispy skin. I love using chicken drumsticks. 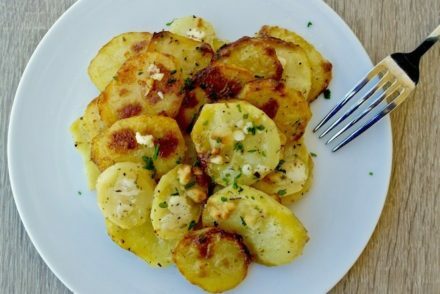 They’re the perfect portion size and your recipe sounds delicious! I’m all in when I see lemon, olive oil and honey! Oh, I cannot wait to make this!! 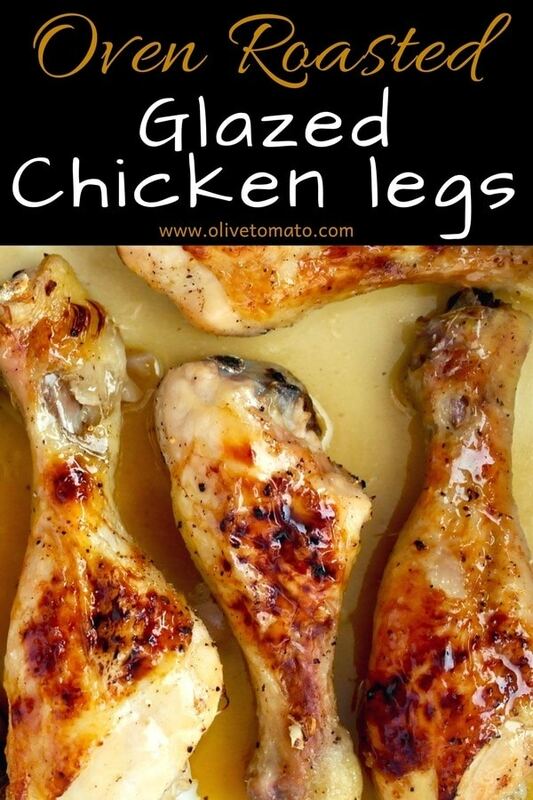 I love drumsticks and rarely find fresh recipes using them. This sounds like the answer to my weeknight recipe prayers! Thank you Elena!! Is there a good reason not to make this with a chicken breast on the bone? Hi Ellen, Chicken breast on the bone should work fine. The garlic clove is meant to infuse some flavor and removed prior to eating.